Caribou and Bangor – Arlene Dyer Milton, 92, passed away August 31, 2018 at Woodlands Assisted Living of Brewer where she had resided the past five years. She was born in Caribou March 7, 1926, the daughter of the late Harry H. and Eva (Paul) Dyer. Arlene was a 1943 graduate of the Caribou High School. She married Maynard E. Milton October 20, 1948 and together they operated a potato farm for nine years and raised their family in the Caribou area. 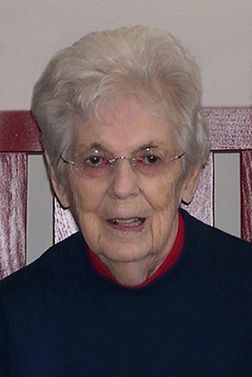 She worked as a Library Aide at the Caribou High School and later at the Caribou Public Library until her retirement. Arlene was an active member of the Caribou Baptist Church, and then was an active member of the Essex Street Baptist Church in Bangor. She was a dedicated member of the choir, participated in the Women’s Prayer Group, Women’s Bible Study, Missionaires and Golden Heirs. Arlene shared her love for family and friends through her many creative talents including cooking, crafts, sewing, quilting, painting, ceramics, flower gardens and much more. In addition to her parents and her husband Maynard, Arlene was predeceased by a brother, Paul Dyer and a sister, Betty Richards. She is survived by four children, Dr. David Smith and wife Phyllis of Caribou, Jeanne Eva Milton of Bangor, Jane Whinery and husband Randy of Hampden and Thomas Milton and wife Cynthia of Ludlow. She is also survived by eight grandchildren, Michelle Mortenson and husband Niles of Logandale, NV, Kathryn Parker and husband Ryan of Stayton, OR, Stephen Smith and wife Heidi of Vail, AZ, Rebecca Whinery and boyfriend Charles Fitzmaurice of Manchester, NH, Shawn Whinery and wife Jacquelene of Swansea, MA, Jared Whinery and wife Megan of Bangor, Joshua Whinery and wife Jennifer of Hampden, Travis Milton and wife Ebony of Hodgdon, 18 great-grandchildren, several nieces and nephews, cousins, including one special niece, Diane Richardson of Tavares, FL. She is also survived by a sister, Wanda Toohey and her husband Bob of Tucson, AZ, a sister Cora Havlir of Dallas, TX and a brother George Dyer and wife Henrietta of Tucson, AZ. Private family funeral services will be held Saturday, September 8, 2018. Friends who wish to contribute in memorial of Mrs. Milton may do so by the charity of one’s choice. The family wishes to extend a heartfelt thank you to Woodlands Assisted Living and Beacon Hospice for the care, support and compassion shown to their mother.